The reminder needs to be paid three weeks 3 WEEKS prior to arrival via Paypal or direct Bank Deposit once the Hostelworld booking is made. If you want to book with less than three weeks notice please make the booking or contact us directly. If there is a reduction in numbers the full ammount will be paid for the remainder of the people on the group. There is a security deposit of 200 pesos per person to be given in cash on arrival for loss of bedding, keys or general damage to the hostel and its contents. This will be returned at departure if there are no incidents. It is important that people booking know that they will be staying in a youth hostel not a hotel. Hello there! Let's make this short and simple. 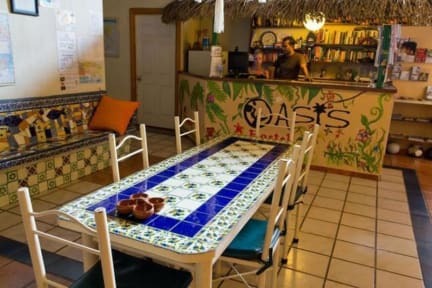 We are the first successful hostel to open in Puerto Vallarta in 2005, 9 years ago. Since then we have always been top rated in Hostelworld and appreciated by all of our customers who most of the time become our life long friends. Many return, year after year and continue to gain amazing experiences with us. LOCATION is ideal if you bring a car or want to be just one bus ride away and no more than 30 meter walk to catch a bus to the station or airport. We are the best combination between a chill out and a Party hostel. We are big enough to accommodate both lifestyles; people who come to calm and relax, but not too big so that we will know your name and remember who you are. KITCHEN Full with all appliances and implements entirely available. With FREE COFFEE and TEA as well as Cooking SALT, OIL, Spices, Garlic, and other ingredients. FREE Drinking Water to refill your Bottle, save $ and the environment, plus ICE for your drinks!! TERRACE to top up your tan on our lounge chairs or hammock with tables to read enjoying an amazing view of the mountains and our open air showers to refresh yourselves! It also has lovely plants and palms all around it. BALCONIES to enjoy the evening air and see the beautiful daily life of a Mexican barrio. CABLE Flat Screen TV to watch our DVDs or just zone out watching TV in English, Spanish, French or German. LIBRARY with books in languages like Hebrew, Svenska, English, French, Spanish, Italian and more. GUIDES loads! in English to plan your travels freely, from lonely planet to rough guides and the rest. GREEN so that you feel no guilt. We have managed to save on energy, waste management, gas and water consumption. SOCIALLY responsible since we volunteer and encourage you to do so in local Charities and events that will create good will and help the community you visit.